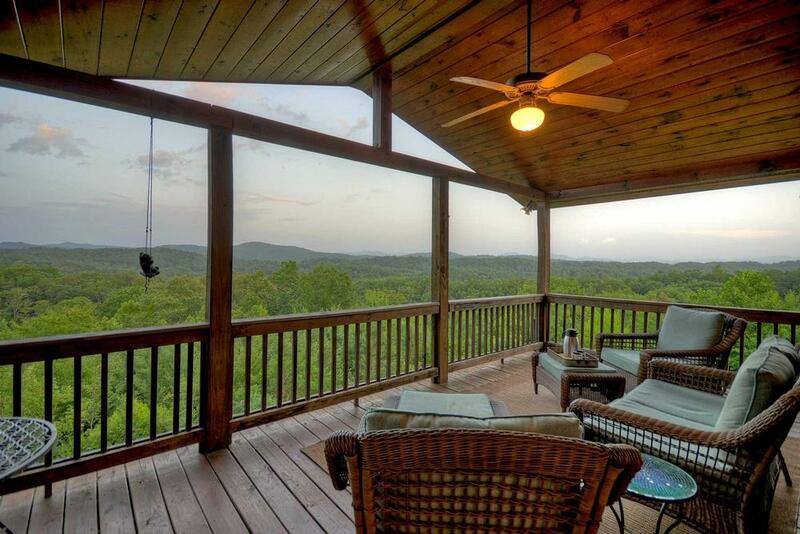 Drive along winding roads up into the Georgia Mountains and you’ll reach a unique North Georgia cabin called Whippoorwill View. Perfect for families, sports enthusiasts or a romantic getaway, this home sits high above it all. 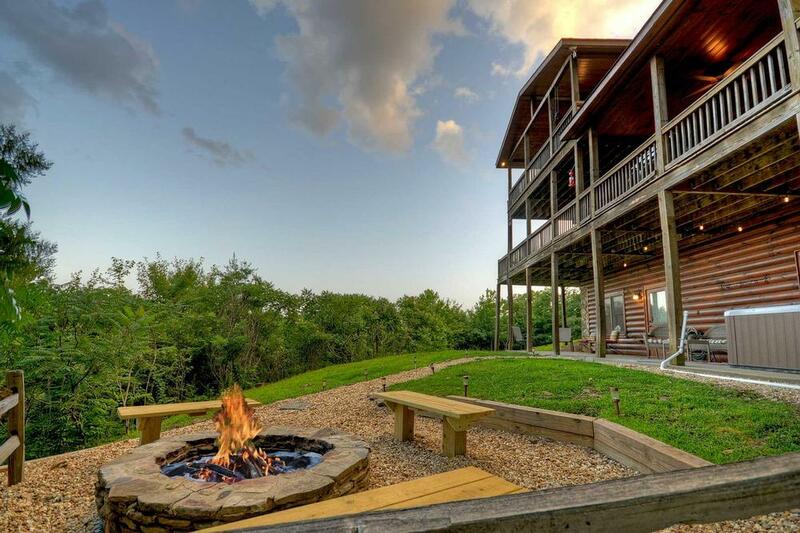 Enjoy magnificent long-range panoramic views of layered mountains and fresh mountain air while the area’s native Whippoorwill birds sing and hummingbirds buzz by. 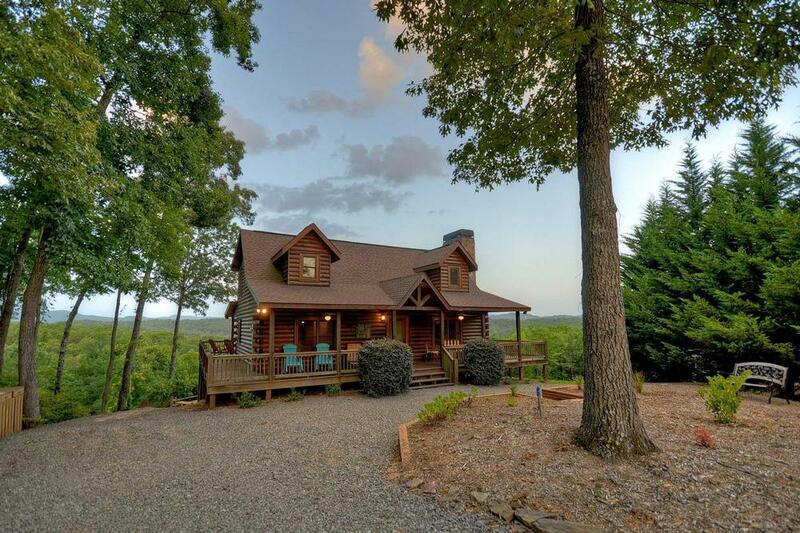 This classic log home is located at the end of a cull-de sac in a small community of other lovely homes with a very private setting and exceptional near and long range views. 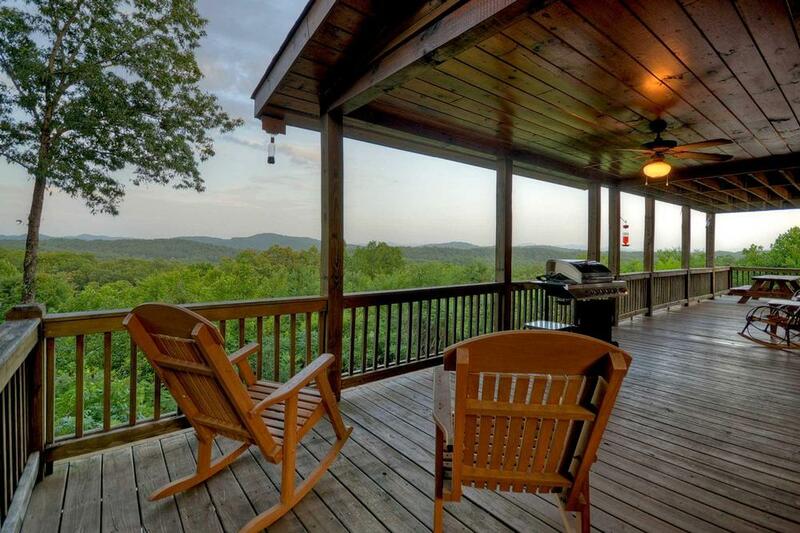 A huge wraparound deck juts out toward the back of the house to make the most of the spectacular scenery and provide an optimal location for rocking chair relaxation. 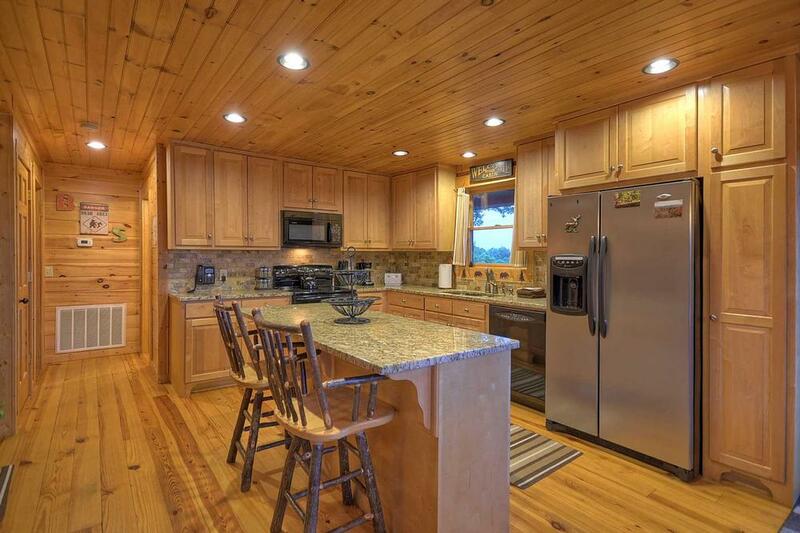 The cabin has a decorators touch and mixes rustic and modern furnishings on three living levels. Light pine wood walls ceilings and floors add to the open and airy floor plan. Each level is furnished with a large flat screen “smart” TV ready for streaming your favorite programs. Each level incorporates unique wildlife and whimsical art pieces. All rooms are equipped with the quality, modern amenities you expect to find in your own home. 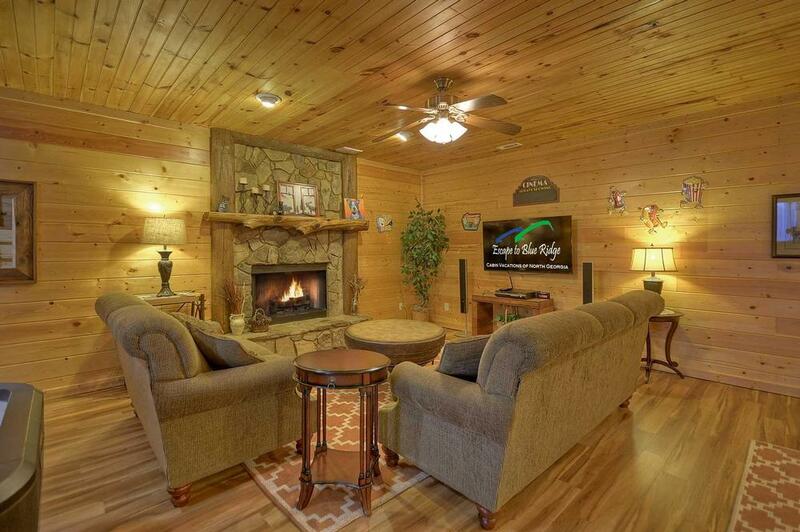 The main level features a floor to ceiling stone fireplace and comfortable sofas with a deep plush rug. The kitchen features maple cabinets with earth tone granite countertops, and is fully stocked with high-end stainless steel cookware, as well as dishes and serving pieces. 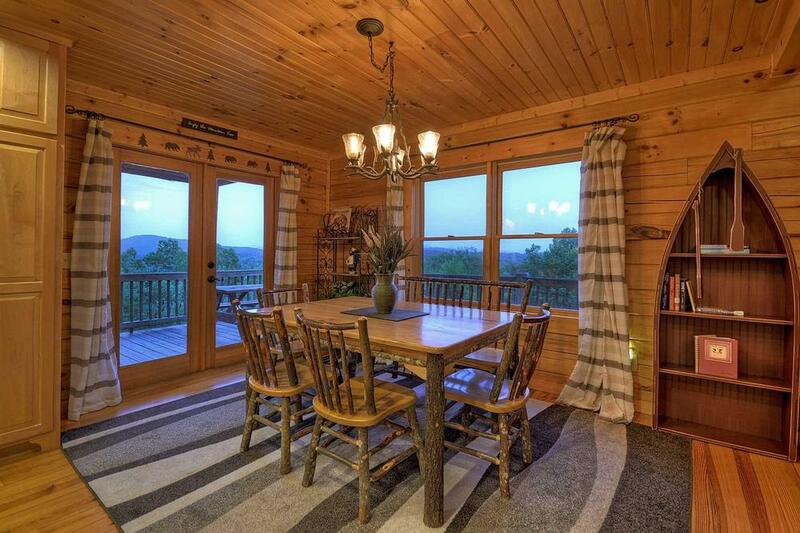 A rustic dining table for six is situated in front of windows with long-range views. The main floor master bedroom features a king-size bed and a luxurious master bathroom with granite counter tops and a Jacuzzi tub. The large loft area is designed with adults in mind and features a full size pool table and 50” flat screen TV, perfect for watching your favorite sports events! A custom bistro table and futon provides additional seating and sleeping. Adjacent to the loft is a private and spacious balcony with comfortable seating and breath taking views. 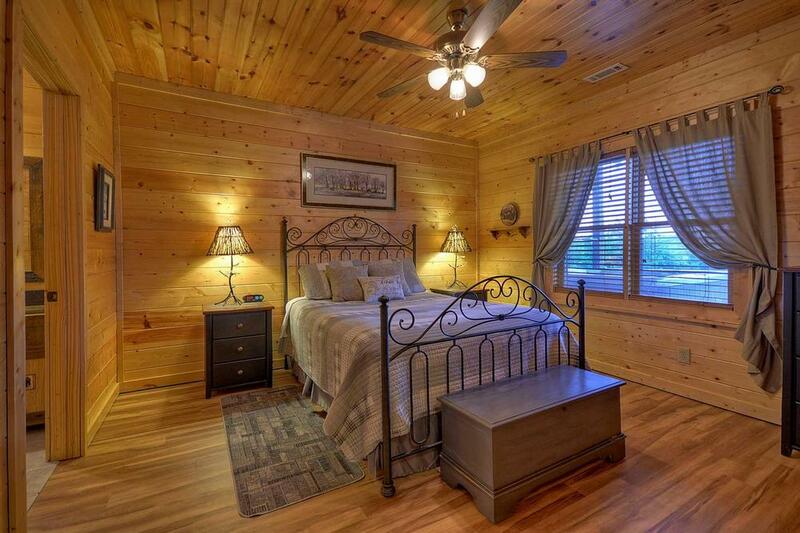 Also, upstairs is the spacious and romantic upper bedroom with a quiet reading area and a full, private bathroom. The basement area is ready for gaming or theater and is furnished with comfortable seating in front of a stone fireplace. A 55” TV, foosball and air hockey tables are available for your gaming pleasure. 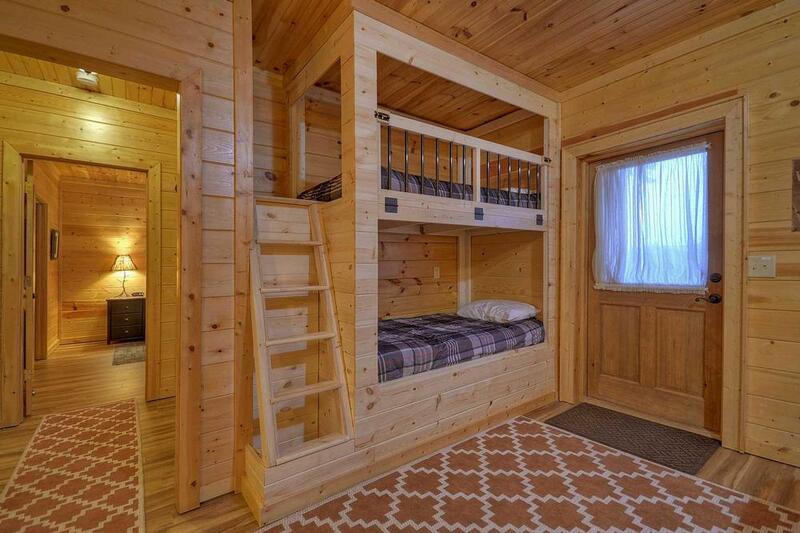 Also, there are custom built twin bunk beds built into the wall to provide "fort" style sleeping fun. Outside the walk out basement door is an inviting hot tub for 5. The basement bedroom features an iron bed and a full private bathroom with a custom wood countertop. 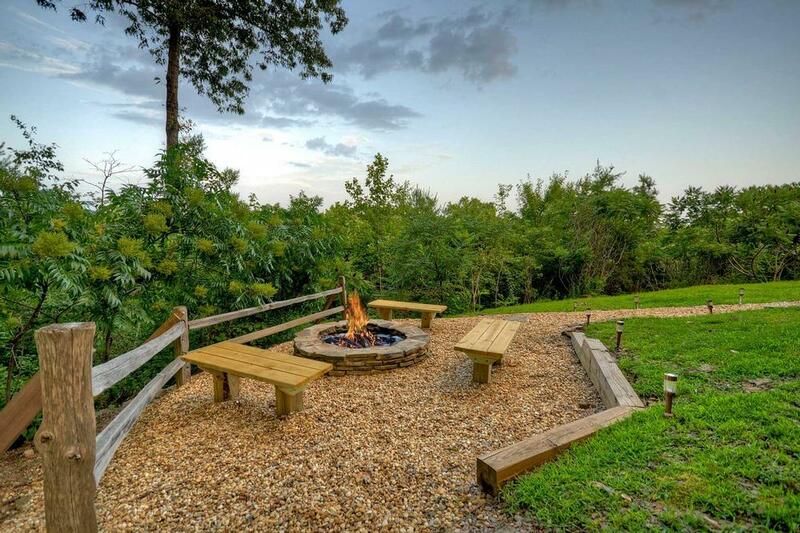 Whippoorwill View makes the most of the outdoors with great deck space and a professionally constructed stone fire pit on level ground a few steps into the backyard. The home’s location in the lovely Whippoorwill community will summon you to enjoy leisurely walks and become one with nature during an early morning adventure or quiet evening outing. 03/19 - Loved the layout, fire pit, plenty of things to do (pool, air hockey, games, etc). 01/19 - We enjoyed the views from each balcony, loved the fireplaces and game room and the down home feel. Pretty first class company. 01/19 - Thank you so much for the most relaxing weekend in recent memory. We very much look forward to visiting again. Great experience with your staff. 01/19 - The kitchen was stocked with plenty of items necessary for preparing meals. The bedrooms and bathrooms were nice and it was great having the bunk beds as well. 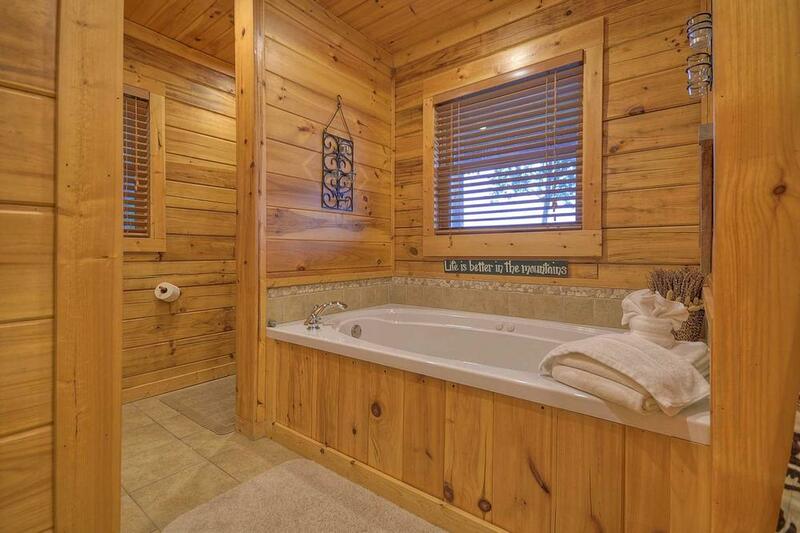 The hot tub and fire pit added to the enjoyment of the cabin along with game tables and puzzles. Very professional staff and able to answer any questions. 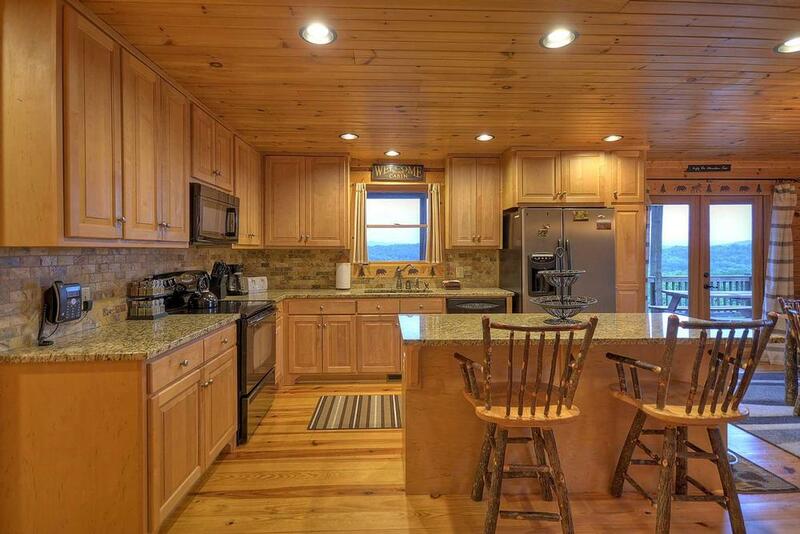 11/18 - Fully stocked kitchen, pool table, foosball, board games, great view, hot tub, plenty of towels and bedding. Excellent company. Pleasure to do business with. 11/18 - The views were fantastic and the cabin super cozy and welcoming. Wonderful company to work with! 11/18 - This is one of two homes I rented for a family reunion so I didn’t stay in this one, but everyone who did loved it. They all said the bedrooms were wonderful and they loved all the porches.This was our 3rd time using Escape to Blue Ridge and we highly recommend this company. They make everything so easy and have the best vacation homes in the area. 09/18 - It was very clean. The view was amazing! Very professional. 10/18 - Great view, nice outdoor space. 08/18 - A great view. The cabin was very well-stocked with everything. Just a nice relaxing stay. 07/18 - Well appointed kitchen; great game room/pool table. The house is spacious enough for 9 people. Nice views and 10 minute drive to Ingles. We have rented from EBR before and we have always been pleased with the properties. We will rent again from EBR. 07/18 - Loved the view! The company is very easy to work with. 05/18 - We enjoyed the view, hot tub, fire pit, game room. Gorgeous mountain views. fun game room for kids. Very spacious and clean. Kitchen was well equipped and perfect for making dinner. Great experience! 2/18 - The home was very nice. Very cozy and comfortable. Great company! Always very nice and helpful! 09/17- We enjoyed the game room, the well stocked kitchen and the deck. Very nice! 07/17- It was very clean and had a beautiful view. The kitchen was fully stocked with all cooking pots, pans, silverware etc. The location was close to everything. Just overall great. We were very impressed. The staff called us back any time we called with a question and then followed up with what they were supposed to do. 07/17- Where do I begin?? We absolutely LOVED this home. It is spacious yet cozy and welcoming. We have stayed in 5 different cabins over as many years, all were wonderful, but this one was super comfortable! Linens, beds, beautifully stocked kitchen...top notch!! I adore all of the people that I have had the pleasure of dealing with at EBR....all are patient with my questions and knowledgeable of the properties. The property listing is impressive! If you can't find a cabin to suit your needs via EBR then it hasn't been built yet!!! 07/17- We enjoyed the view and the location. Your company is awesome. 05/17- This home was amazing! The kitchen had everything we could need, loved the grill outside. Views were magnificent. The game rooms were lots of fun and our boys loved the bunk beds. This home was so comfortable and in a beautiful setting. The house was very well maintained and we had a wonderful weekend away. We want to return to this home! Renting this home was so easy and your staff was very attentive and fast as this was a last minute booking. We loved the gift we received upon arrival - I would definitely rent again through Escape to Blue Ridge! 05/17- Spent a lot of time on the top level relaxing. 04/17- This home has fantastic panoramic views and is very comfortable and well equipped. We enjoyed seeing wild turkeys in the back yard and loved the fire pit area. The upper loft and adjoining deck are perfect for wandering between a sporting event on the big tv or beautiful nature views. Everyone is always very polite and professional. Very responsive as well. 03/17- We were looking for a property with a view and we definitely got it! Our favorite place was the private porch on the 3rd floor...watching the sunrise in the morning and the stars at night. The cabin had everything we needed from the well appointed kitchen, to the gated deck for our dog. We had everything necessary to make our stay relaxing and enjoyable and look forward to returning again soon! Escape to Blue Ridge was professional and courteous. We will be using you again in the future. 11/16- LOVED the wrap-around porch. We chose this cabin specifically for this porch. Our dog definitely got in her exercise by doing laps several times each day. The upper outside deck was my favorite place to hang out at night & just listen to the critter noises, so very calming. 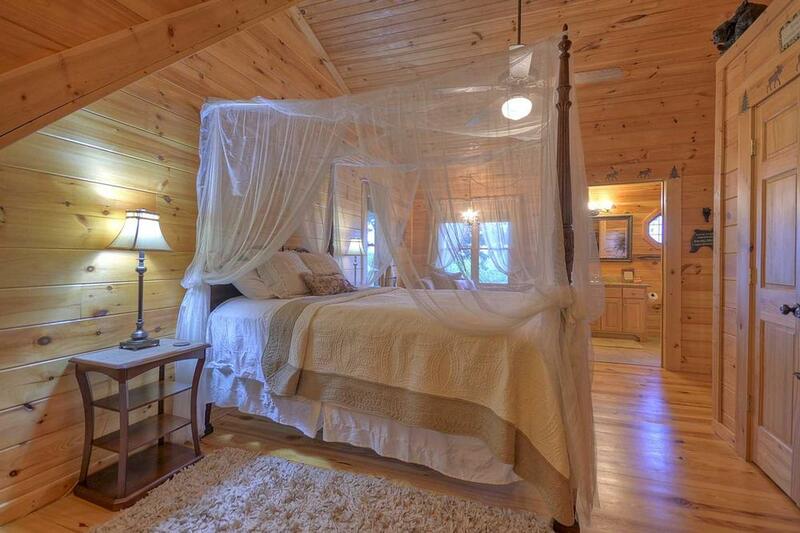 I would DEFINITELY rent this cabin again. We highly recommend your company to everyone/anyone who will listen. We have rented from you for the past few years & have never been disappointed. Everything is exactly as pictured/described. YOU GUYS ARE THE BEST! 10/16- We loved the view, the fire pit and the Pool, Foosball and Air Hockey tables. Great customer service. Fast call backs. 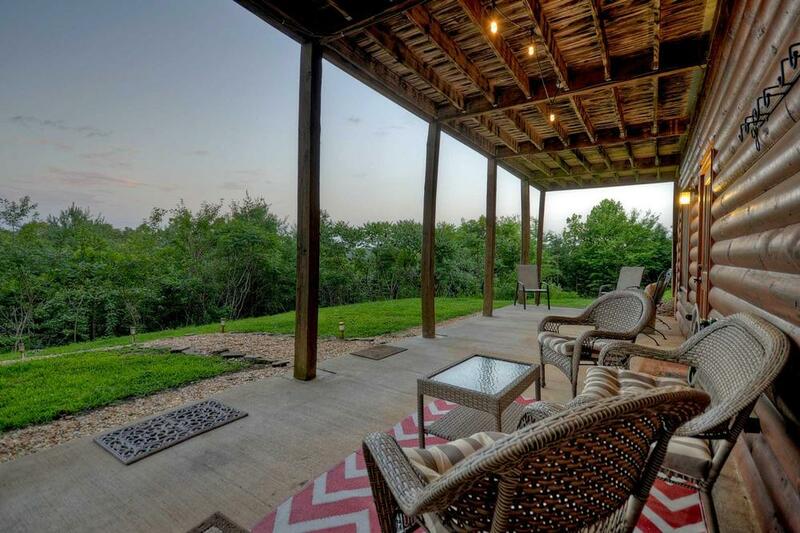 09/16- The home was in a perfect location in a quiet neighborhood with beautiful views. The home is one of the best we've stayed in so far. It is beautifully decorated with absolutely everything you would need. The home was perfect for our family of four but could easily sleep another family comfortably. This was our second time using Escape to Blue Ridge and won't be our last. The staff is always quick to respond and super nice and helpful. The homes have both exceeded our expectations. The small gifts left for guests in the cabins also leaves a lasting impression. 08/16- Amazing, Super spacious, clean, comfortable. More than I expected form the vacation home I stayed at. The spacious room and bathrooms were excellent. Can;t wait to come again. 06/16- The cabin was very clean, roomy, comfortable. We had everything we needed, which helped out when preparing meals, etc. 06/16- Seclusion and honest to deal with. 06/16- We loved the open kitchen concept. The had everything you could imagine in the kitchen to use. Our family was traveling together; 3 adults and 2 small kids. We brought kid blown up kids that are safe for small kids. Unfortunately are 1 year old loves his crib and wouldn't sleep in the bed but kept getting out of it. We looked around the house and what do you know they had a pop up crib in the closet that was so easy to put together. 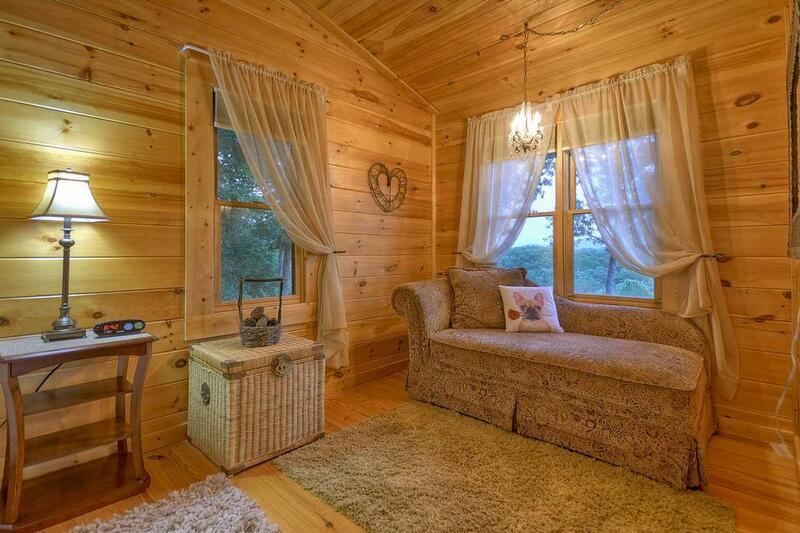 06/16- The cabin is very well furnished and has fantastic views. There are numerous hiking trails available immediately in the walking area. I appreciated the little touches like light blocking shades, humorous art and plenty of flat screen tv's. 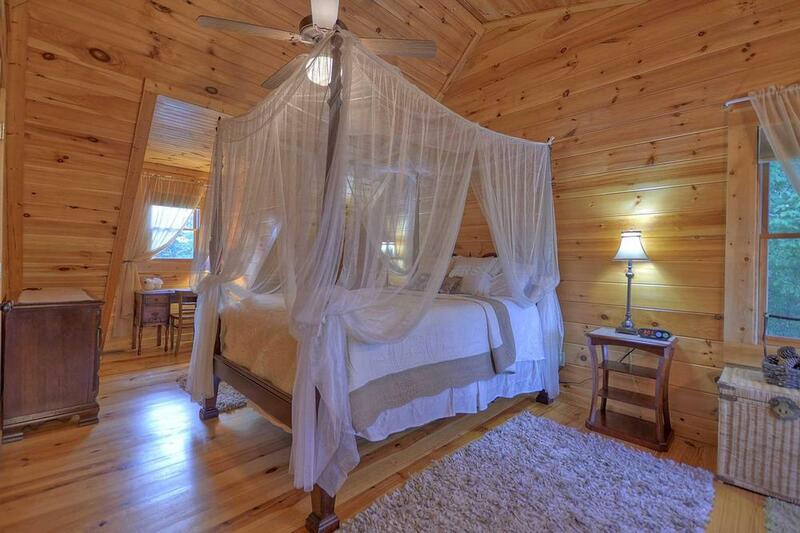 If your looking for a romantic getaway or a weekend with the kids this cabin has it all in style. 03/16- The panoramic view! We slept in the master bedroom which was very comfortable. house was great. Kitchen had just about everything we needed. We will be back to this house in the future. 03/16- Very nice home with updated decor and finishes! Loved the pool table, hot tubs, fire pit, multiple tv's, and the great view! 12/15- The view was wonderful! 11/15- This cabin had everything. The pictures did not due it justice. 11/15- The layout was great , the grounds were well kept , the hot tub was clean, as well as the whole cabin. View is FANTASTIC ! The company was VERY EASY TO WORK WITH . RETURNED PHONE CALLS IN A TIMELY MANNER. 10/15- The view is amazing here. 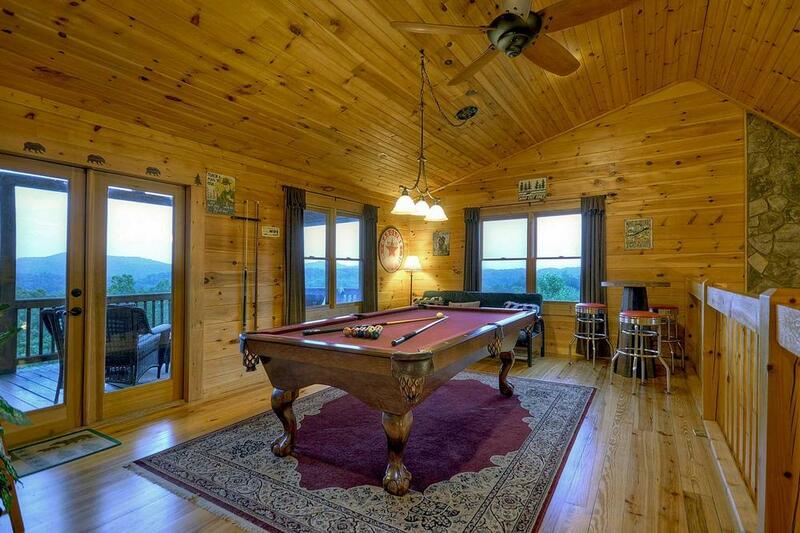 The cabin is lovely, clean and the amenities like pool table and other games were there when we wanted. The peaceful surroundings made relaxing easy. This is the third year we have used this company for our fall vacation and we have never been disappointed. The staff is ALWAYS friendly, courteous and ready to "go the extra mile" for us! Thank you for making this vacation perfect! 07/15- Space and lay out were great. Company was very professional and easy to work with. Lisa was very helpful on our check in. Overall extremely pleased. 07/15- This home was very cozy, lots of room and activities. I really enjoyed my time away with all my children. 06/15- I loved the location and the entertainment that the cabin had, air hockey & pool table, didn't get a chance to use the hot tub but we will on next visit. was pleased with the whole experience. They called within seconds when I made my reservations, that's what I call fast service. 06/15- View is peaceful! Great company!! 04/15- The home was very cozy and welcoming. It was relaxing. Will definitely stay again. 02/15- Our favorite features was the view. Our impressinon of Blue Ridge over all was very nice we enjoyed the view and the space. 10/14- Nice, quite, clean. Very nice exciting stay, will definitely return! 09/14- Secluded and private. Open architecture. 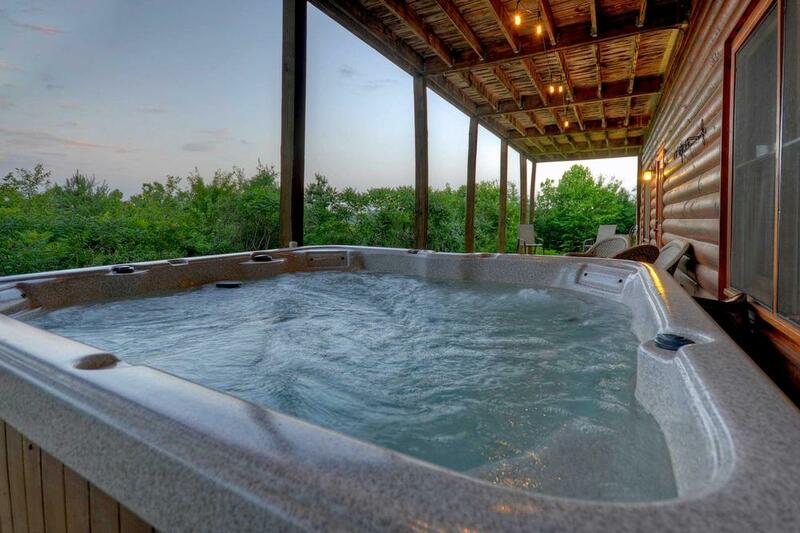 Hot tub on the top deck. Pool table very nice as well as the other games. Directions to cabin were excellent. Helpful books on area. View of the mountains. Wrap around porch and rocking chairs.Very helpful and friendly. What was on the website was what we experienced so no over sell on the web, very refreshing. Facility ready for use on our arrival, that was sweet! Thanks for a memorable weekend. 09/14- the view was amazing, the hot tub had a great view as well. the home was decorated very nice and had every kitchen item needed. overall it was a very comfortable stay. we would recommend it to anyone and will defintely return in the future. 11/15- The cabin was very comfortable and inviting. The views are unbelievable! I have rented this cabin before and the new upgrades are fantastic! The beds are very comfortable and the new furnishings are awesome! I will definitely come back to this cabin often! Escape to Blue Ridge is very pleasant to deal with and quick to respond. I would recommend this company when looking for a cabin rental.